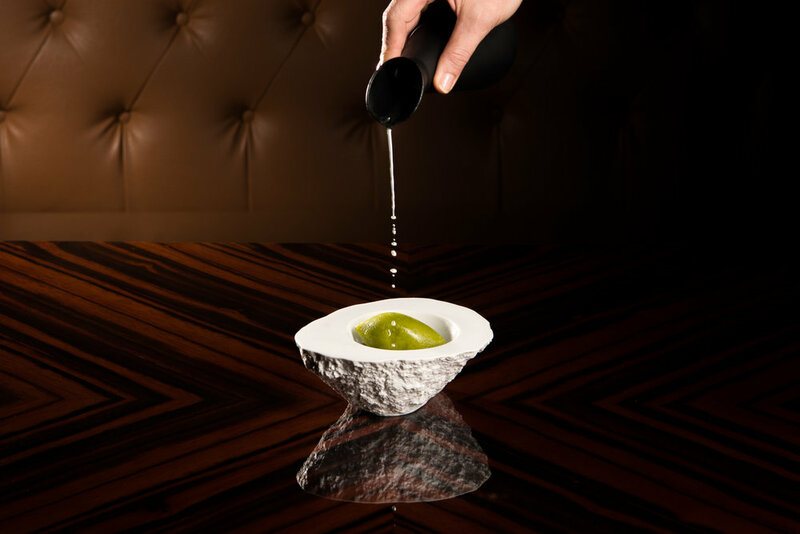 Bacchus Restaurant is one of Brisbane's premier fine dining destinations serving modern Australian cuisine. I was recently invited to dine at the multi award winning restaurant to experience for myself this fine destination. The restaurant is located within Rydges South Bank and is decorated in sophisticated tones of caramel with mahogany and marble touches, service is superior and attentive and your every request is never too much trouble. Bacchus is now home to celebrated Italian flavour maker and fine dining specialist Massimo Speroni. Appointed as Head Chef, Speroni joins the Bacchus team direct from the 2 Michelin-starred restaurant San Domenico in Imola, Italy where he was Sous Chef, working with owner-chef Valentino Marcattilii. To begin our dining experience we were treated to a pre entree before chosing from the newly created Raw and Cured menu. We chose the Ora King Salmon from Marlborough Sounds, New Zealand, pictured below, which looked and tasted exquisite. For entree I chose the Textures of Beetroot - Goats Curd, Crispy Amaranth and Xeres Vinegar and my husband selected the Foie Gras - smoked potato, 30 year old balsamic and seasonal vegetables. Main meal I enjoyed the Chicken - Grilled Breast, Croquette, Herb salad and Tarragon Jus and my husband couldn't resist ordering from The Grill Menu, he chose the 500g Rib Eye on the Bone and declares it to be "the best steak I have ever eaten". Our meal was made even more special with touches such as a palate cleanser and pre dessert specialty. The final piece de resistance when dining at Bacchus and only recently introduced in the restaurant is the incredible range of white hand crafted Spanish Pordamasa plates, Bacchus are the only restaurant in Queensland to use these unique plates, see below. I always look forward to Dessert whenever I dine out and on this occasion we both chose the Coconut Cheesecake with Butterscotch, which is almost too pretty and too perfect to eat, but we did and it's light sweet taste was the perfect ending to our meal. Our fine dining experience at Bacchus Restaurant was first class - to be surrounded by elegant decor, served by professional and polite staff whilst eating beautifully plated Australian sourced produce, this was a night I will remember forever. I can highly recommend Bacchus for your next special occasion.